How to Transfer Photos from Camera to iPad for Windows/Mac? Home> Resource> iOS Transfer> How to Transfer Photos from Camera to iPad for Windows/Mac? You can agree that photos are a part of any memorable and enjoyable event, such as wedding ceremonies, anniversaries, picnics, honeymoons and tours. Did you know that you can transfer those photos to your iPad instead of printing them? With an adapter from the app store you can achieve this simple task. There are many methods of transferring those cute photos in your camera to iPad. The following guide is going to explain two simple methods for you to import pictures from digital camera to iPad easily. Step 1: Turn on the digital camera and the iPad respectively. Thun plug in the USB cable from your camera and connect the other end of the cable to lightening and then to the USB camera adapter. Step 2: Tap the photos application on the screen of your iPad, then a new button at the bottom of your iPad will appear automatically. Tap on it to see the pictures that are there for importing. Step 3: Choose the photos that you would like to import to your ipad by tapping on them one by one. Then you can click "Import" button and the photos will be highlighted. If you want to import all the photos, you can tap the import all button and all the photos in your camera will be highlighted. After importing process is finished, you will be asked if you want to delete the photos or delete them from the camera. Obviously, this leaves you with the choice. You can either delete them to free the space or keep them for other purposes as you like. First of all, you need to export the whole photo folders or specific pictures you need from camera to personal PC. You can set a new folder on your desktop computer to save the exported images. 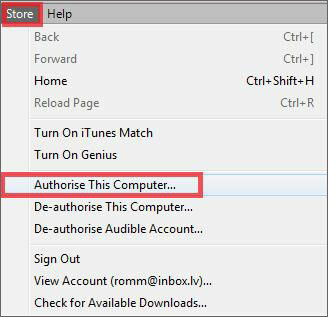 Secondly, you can run iTunes on your computer, and click "Authorize This Computer" option in the drop-down menu of "Store" by using your Apple ID account & password. Then you can click "File" > "Add Files to ..." or "Add Folders to ..." button to sync your needed pictures from computer to iTunes with one simple click. 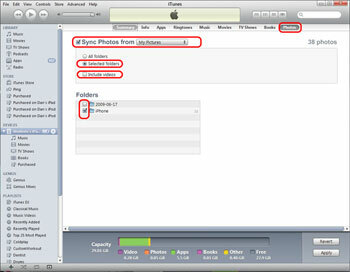 Thirdly and finally, connect your iPad devices to the computer with USB cable, and make it be recognized by the iTunes. Then find your iPad under the option of "DEVICE" in the left panel, then you can click "Photos" tab in the right panel and choose "Choose folder... > Sync Photos from" to load the synced camera photos to iPad completely. How to Transfer Movies from iPad to Computer/Mac? Is It Possible to Transfer Songs from CD to iPhone? How to Transfer Music from iPhone to Windows 10? How to Transfer Photos from iPod to Computer/PC? How to Transfer iPod Photos to Mac OS X? How to Transfer Music from iPad to iPod or from iPod to iPad Easily? How to Transfer Kindle Books to iPad Air, mini, the new iPad, etc. ?